The Dallas Opera’s latest production, “La Traviata,” which opened on Friday, is at once thrilling and appropriately sentimental. Co-produced by Florida Grand Opera and Cincinnati Opera, this rendition of Giuseppe Verdi’s tragic opera is not to be missed. If you aren’t familiar with “La Traviata” (which translates roughly to “The Fallen Woman”), Violetta, a courtesan suffering from tuberculosis who has taken a variety of wealthy lovers, eventually falls for the heroic, but poorer Alfredo Germont. They live happily together on a country estate until Alfredo’s father, Giorgio Germont asks Violetta to leave so that Alfredo’s siblings are more desirable for marriage. She has brought shame to the family. Violetta leaves so that Alfredo can have a better life and goes to a party with her old friends. Alfredo arrives and, in a flash of anger, embarrasses her in front of the entire party. Six months later, in her apartment in Paris, Violetta lies dying from tuberculosis. Alfredo and Giorgio arrive to beg for forgiveness, and she dies in Alfredo’s arms. Greek soprano MyrtÃ Papatanasiu plays a nuanced and captivating Violetta. Her voice is consistently rich and sonorous throughout her difficult role and variety of registers. Coloratura is handled expertly, particularly in “Sempre libera” at the end of the first act, in which Violetta decides to pursue her free life as a courtesan. Her artistry with tempo and dynamics is impressive, which is essential for a Verdi opera. Equally strong was Papatanasiu’s acting, which avoids the temptation to self-indulge in the role. James Valenti gives a strong performance as Alfredo Germont, Violetta’s lover, though his stage movement was a little stiff on opening night. Still, he makes up for it with clear singing that varies appropriately in color. Alfredo’s initial declamation of love is passionate and full, while Act III’s Alfredo is sensitive and remorseful. Together, Papatanasiu and Valenti make a visually and musically gorgeous couple. Baritone Laurent Naouri is a stern, stoic Gorgio Germont. His voice was equally powerful, though occasionally lost in his Act II duet with Violetta. Other characters include Aaron Blake as Gastone, Amanda Crider as Flora, Tim Mix as the Baron, Mark McCrory as the Marchese, Ethan Herschenfeld as the Doctor, and Susan Nicely as Annina. SMU alumn Bobby Tinnion plays Flora’s Servant. The chorus performed well, although it rushed ahead of the orchestra slightly at the end of Act I. Under the baton of Marco Guidarini, the orchestra performed admirably with sensitivity, tackling difficult and exposed parts with grace. The set is heavy with shadows through all three acts, hinting at the tragedy that will befall Violetta. Of particular note is the party in the second half of Act II, dominated by red and gold that is at once sumptuous and scandalous. All of the set is reminiscent of Victorian decadance, with elaborate gilded furniture. Costumes are also beautifully complex, particularly during the party scene, in which several of the chorus members break the staid, Victorian mold with exotic Eastern and African party attire. 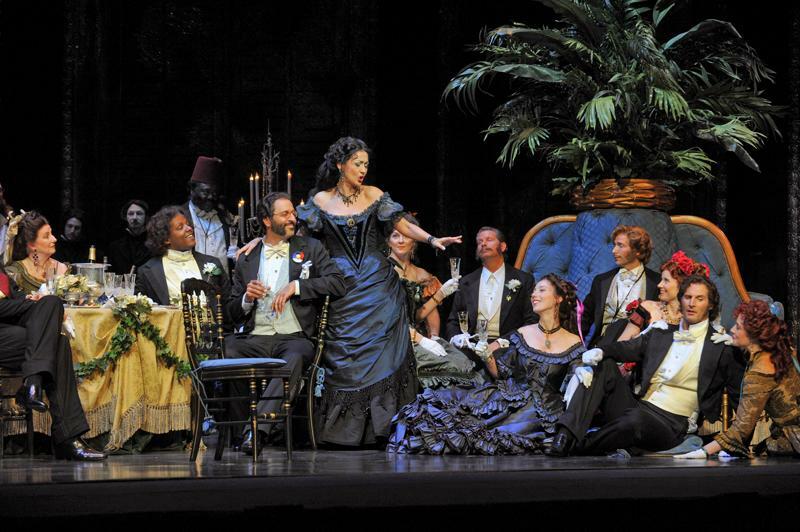 Even if you are not an opera buff, you owe it to yourself to see this production of “La Traviata.” It promises to be entertaining and electrifying. Additional performances are April 18, April 21, April 27, April 29 at the Winspear Opera House. Tickets are $25 to $250. Students can purchase best-available seating for $25 to $50 at the box office 90 minutes before the performance with an SMU ID.